As a professional ballet dancer, having the opportunity to interview Charles “Lil Buck” Riley—you know, the dude who went viral in 2011 for pairing his sick dance moves with Yo Yo Ma’s sick cello skills—was almost more than I could handle. Almost. But I suppressed my inner bunhead and kept it professional as I chatted with him ahead of his L.A. stage premiere. 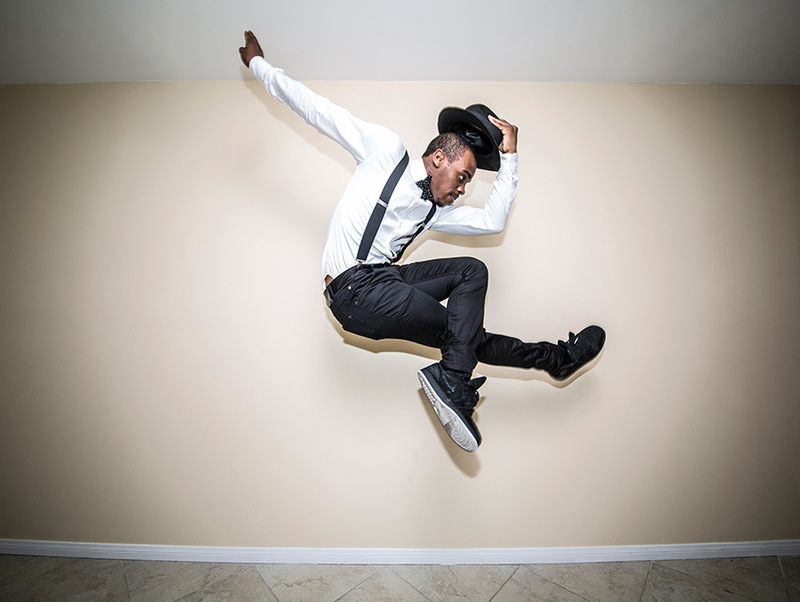 Buck is a Chicago-born, Memphis-raised, Las Vegas-based dancer who specializes in Memphis Jookin’, a style that fuses the rigor of ballet with the quintessential cool of hip-hop and street dance. He is largely credited with bringing the technique to the masses thanks to his overnight YouTube success, and it’s easy to see why the moves have captivated more than three million viewers: Lil Buck appears to defy the laws of gravity with an annoying amount of ease, bending and bowing his body with the music. Speaking as someone in the “industry,” let me tell you: it’s not effortless. In dance, the rule of thumb is that the easier something looks, the harder it is to execute. This weekend, Buck is taking a break from touring with Madonna and working with artists like Spike Lee and Baryshnikov for What Moves You, a two-night-only engagement at the Broad Stage. Accompanied by cellist Mihai Marica, another groundbreaking young artist, the program is set to be an intimate and illustrative collaboration of music and dance. We spoke with Buck ahead of his Friday and Saturday night shows to talk about the roots of Memphis Jookin’, what we can expect from his inaugural show, and where he’s headed next. Even though you lived in L.A. briefly, this is your stage debut. What’s up with that? I haven’t performed here before because my schedule didn’t make that possible for me. But I’m able to make it happen now, and I’m very excited about performing at this venue with Mihai and with another special guest that no one knows about yet. Can you tell us who your “special guest” will be? I’m allowed, but I won’t do it—because it wouldn’t be so special if I revealed it. Your style defies genre. How would you describe what you do? Memphis Jookin’ started in Memphis, and it’s very native to the people. It’s a culture and a part of our lives. We take Jookin’ to the heart. It’s a very spiritual dance; it’s a connection with the Earth and with the ground and with the feet. You use your whole body, but we really put a lot of emphasis on the feet: A lot of crazy glides, slides, kicks, and toe spins. Then chopping all of that up and putting it all in one, as well as upper body. It sounds a lot like ballet, the way you describe it. It’s “street ballet,” if you will. You wear “sneaker pointe shoes.” Are they similar to normal pointe shoes? They might hurt less, actually. Sometimes it gets crazy, but for the most part, it’s just as simple as having the right shoes. We just do it. Make it happen. What inspired you to pursue Jookin’ professionally? Did you always know that you wanted to make this a career? It was the one thing I knew I wanted to do from a young age. I was lucky enough to be one of those people who actually knew what I wanted to be when I grew up. And the younger you are when you know what you want to do, the sooner you can set goals. Then, the sooner you get to work towards making that a reality. If you do that, the more experience you gain. That’s basically what inspired me to keep going with Jookin’ and putting that style out there like I’m doing now, because it’s an amazing dance style. It has been underground over 30 years. Why has it been so underground for so long? How does it feel to bring a pivotal part of your hometown’s identity to the mainstream? Half of the reason was because we wanted it that way. We didn’t want outsiders coming in and taking it, doing it somewhere else, and calling it their own. We kept it underground for a long time, and it wasn’t until YouTube and everything came out where we could actually put our dance style out there and bring it out into the world without being afraid of anyone coming and trying to take it. Or any choreographers coming to our town and trying to take this dance style. It’s one of the only prized possessions we have besides the blues, Elvis, and barbecue. What can we expect to see at this weekend’s show? There are no characters. Supernatural. Very organic. Me. Mihai. A story about energy. Basically, it’s a movement that goes from darkness to light. It’s kind of the story of my life, and a lot of peoples’ lives. We’re using Bach as the train throughout this whole journey…to the point where we saw the light at the end of the tunnel, and the world was revealed to us: opportunity and bliss. It’s kind of an emotional roller coaster, watching the show. You can see these different points and these different details that really hit hard. Yo Yo Ma called you a genius. Where do you even go from there? Yo Yo is just a nice guy. He tends to be overly nice and say things like, “Oh Lil Buck’s a genius.” All of us are performers: Yo Yo, myself, Mihai. We’re all geniuses at our craft when it comes to the time, effort, and practice we put in. And passion, most of all. The attention to detail—that is what makes someone just a genius at what they do. What’s next for you after What Moves You? Next is really working with Memphis now, building more infrastructure in my own city. I had to leave my city to help promote it, but now that a lot of people know about Memphis Jookin’, I want to let people know that I’m not the only person that’s doing this. I want to open up more doors for other talented, amazing artists in Memphis. There’s not really a platform or an outlet in Memphis for someone to pursue their dreams as far as the performing arts, so I want to build more infrastructure in the city to prepare people to be ready to take on the world outside of Memphis. Or I want to help start something that will bring attention to Memphis so we won’t always have to leave our own city just to pursue a career. → What Moves You is playing at the Broad Stage Friday, May 13, at 7:30 p.m. and Saturday, May 14, at 7:30 p.m. Tickets are priced from $40 to $85 and are available online or by calling 310-434-3200.